CommsConsult recently said bon-voyage to Emma Clunie, who has gone to work for Polgoon, a Cornish vineyard run by her family. Emma has been a key member of the team working on Research to Action over the last two years, and will be very much missed. Her dazzling social media, website and project management skills freed up valuable capacity, enabling the R2A team to develop new projects and a strategy to take the initiative forward into its second phase. 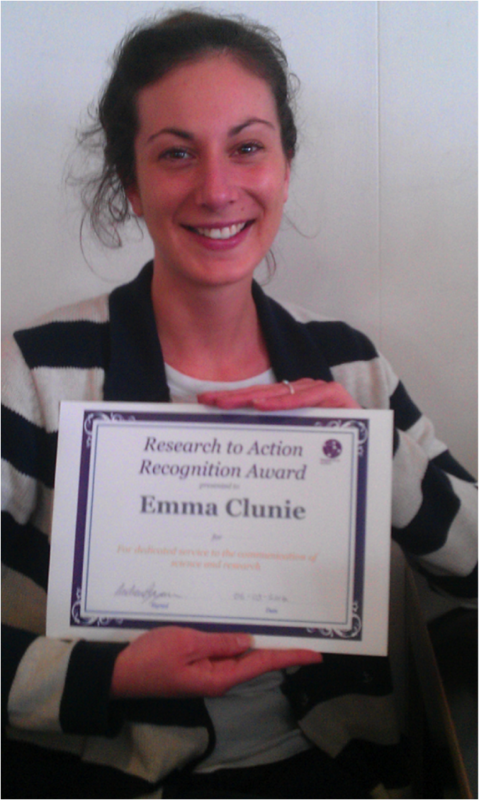 As a way of saying thank you to Emma we proudly presented her with the first honorary ‘Research to Action Recognition Award: For dedicated service to the communication of science and research’. The CommsConsult team would like to wish Emma the best luck for the future, and we are all looking forward to our inaugural wine tasting event at Polgoon to further mark Emma’s departure and to celebrate all she achieved with us. We are very pleased to have Emma join us at Polgoon, your loss is our gain! As compensation I think one of her first tasks should be to arrange a wine tasting event for you and yours as you suggest! That sounds great to us!